These wicks all come cut into 6"� lengths are primed in a high melt point paraffin wax and are tabbed with 20mm round tabs with 6mm necks. 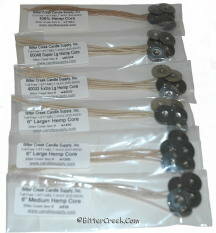 *Hemp Core Wicks are tested and sized based on use in a Straight Paraffin Wax with No Additives. Wicks are based on the WIDEST area diameter of the jar you plan to use. This is typically not measured at the opening unless the container is perfectly straight up and down. H100M Extra Small 1 - 1.5"